Up to two children under four years can be accompanied in the water by one adult (16+). Children under the age of four must wear suitable buoyancy aids (not provided). buoyancy aids are strongly recommended for all non-swimmers. Exclusive 30 minute sessions for parents & under 5’s in the leisure lagoon with floats and aquatic toy. 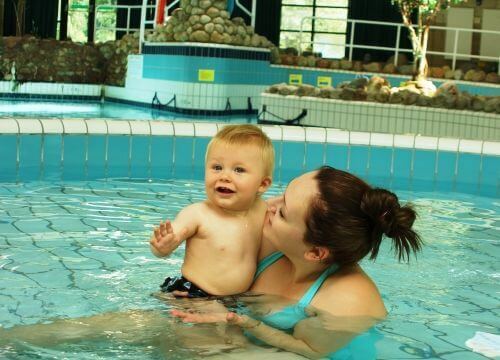 Parent & Toddler Plus also has the addition of an instructor in the water to help advise and support toddlers' fun swims! Mondays, Wednesdays & Fridays 10.30am. These are very popular sessions. Please book in advance (up to 7 days) to avoid disappointment. Exclusive 45 minute sessions for parents & under 5’s in the leisure lagoon with floats and aquatic toys. Should you wish to cancel or move a booking, 48 hours’ notice is required prior to the start time of the activity. If you fail to attend a pre-booked activity or do not give the required notice you will be liable for the cost of this booking at full standard adult charge plus an administration charge of £1.50. Customers with arrears against their membership may have their membership account suspended.